Q: How long does it take colorectal polyps to turn into cancer? A: We think the whole process takes about 10 years. 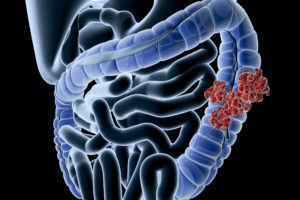 A colorectal polyp begins with a gene mutation in one of the stem cells that are constantly dividing to produce the cells that line our colon. Each of the stem cell’s “daughter cells” inherits that gene mutation, which makes them grow faster and live longer than nearby cells. Only a few mutations cause cancer. But colon cells grow and divide so rapidly that we replace the entire lining of our colons once a week. And each time these cell divide, they pick up more and more mutations, and the risk of cancer rises. 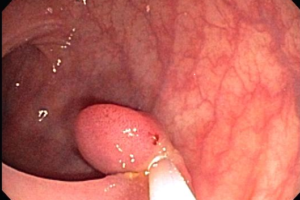 As cells with the mutation build up on the surface of the colon, they form a small cluster that appears as a polyp. They continue to divide, picking up even more mutations — some in the genes controlling cell growth. So the cells start growing faster, and the polyp enlarges. Thankfully, because this is a slow process, getting regular colonoscopies to find and remove polyps — while they are still in the benign or precancerous stage — can prevent cancer and save your life.